Unless you move in certain circles you may never have even heard of the Q phenomenon; it’s almost never in the news and very seldom comes up in anything resembling mainstream discourse. But for people like me who write about the behavior of America’s unelected power establishment, it comes up a lot and can be a bit of an obstacle to the lucid sharing of ideas and information. To summarize, someone claiming to be an insider with “Q clearance” began making posts on the anonymous message board 4chan, a notorious online playground for millions of meme creators, trolls and nerds which has fostered a massively enthusiastic pro-Trump zeitgeist since 2015. 4chan users refer to one another as “anons”, so “Q” is often referred to as QAnon. Q would share intentionally vague clues they referred to as “crumbs” and encourage readers to research what was meant by them, usually leading toward incriminating information about Trump’s political rivals and never toward any incriminating information about Trump. The posts moved from 4chan to the related forum 8chan, with disputed claims of authenticity. This has created a dynamic wherein an anonymous poster shares extremely vague messages, and many thousands of Q enthusiasts go off combing the internet to find out what is meant by them. There are disputes within the community about precisely what is meant by which posts, but the net result is universally the same: all the information confirms that Trump is a brilliant hero who is fighting the Deep State, and all of Trump’s political enemies are corrupt criminals/pedophiles/satanists. All that is asked of Q’s army of woke patriots is that they have faith and trust the plan, and to know in their hearts that soon the President of the United States will solve all the nation’s problems. 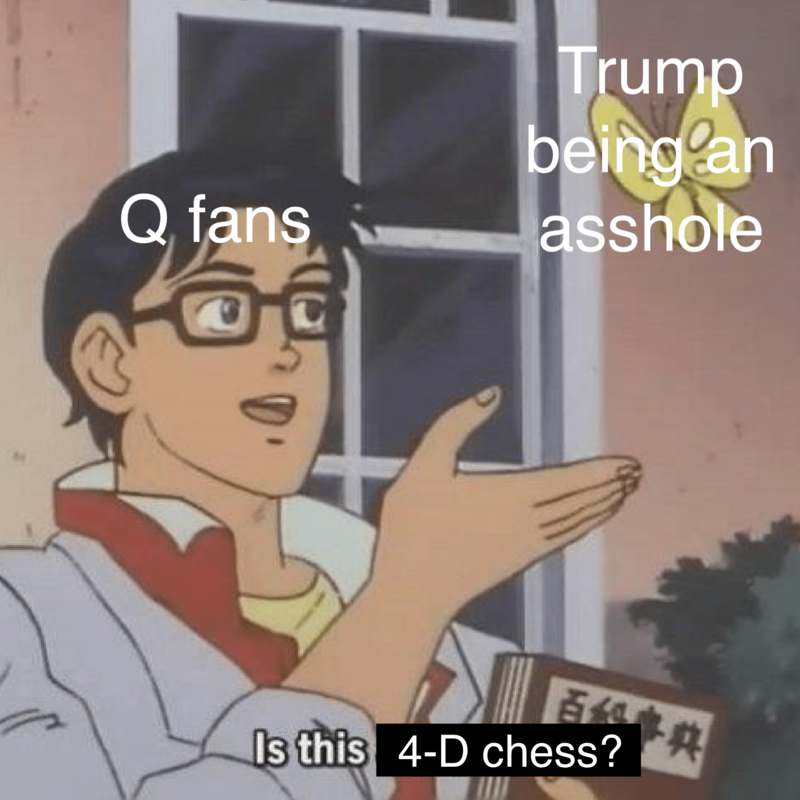 I’ve been openly critical of Qanon for many months, but it’s hard to write anything substantial about this subject because the QAnon phenomenon is so amorphous and is spread all over the internet in a sprawling, non-cohesive conversation consisting of many thousands of parts, so anything you say about it will be immediately slammed as untrue by its more passionate enthusiasts because you’re not saying it in exactly the way that they would say it. That plus the faith-based, religion-like reality tunnel Q enthusiasm requires one to espouse makes engaging this topic about as much fun as debating creationists online, so I’ve been avoiding writing about it. 1. I referred to #QAnon today as a ‘Pied Piper’ operation. What I meant by this, is that the operation exists to round up people that are otherwise dangerous to the Deep State (because they are genuinely opposed to it) usurp time & attention, & trick them into serving its aims. 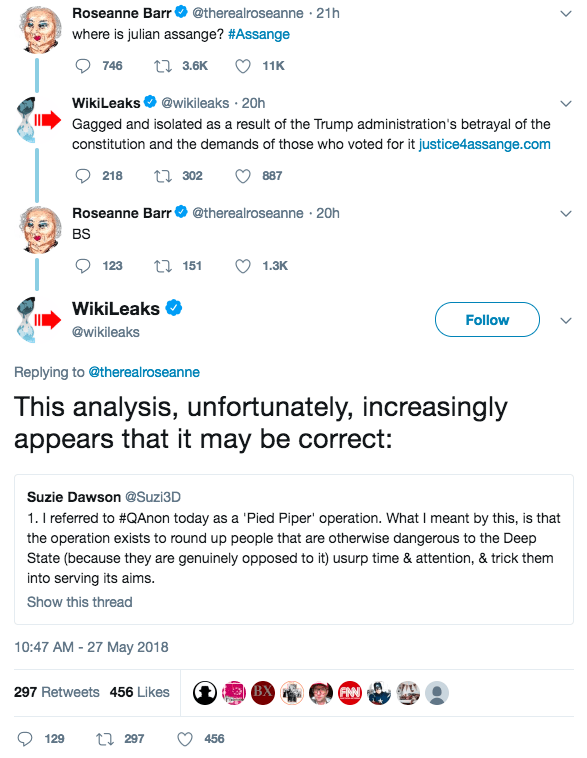 In response to a tweet from Roseanne Barr asking “where is julian assange?”, the WikiLeaks account (which has long been a multi-user account run by a rotating WikiLeaks staff) replied that he is “Gagged and isolated as a result of the Trump administration’s betrayal of the constitution and the demands of those who voted for it.” Barr, who has promoted QAnon in the past, replied that WikiLeaks’ answer was “BS,” to which they responded with Dawson’s thread. So on one hand we’ve got WikiLeaks insiders saying QAnon is a likely psyop designed to Pied Piper the populist right into supporting establishment agendas, and on the other we’ve got an anonymous someone on 8chan saying “trust the plan” and the President is awesome. These are not equally credible sources. It would make perfect sense for the US intelligence community to conduct psychological operations against those on the right who espouse anti-establishment ideals, since they’ve been conducting them on the anti-establishment left for generations. Any political faction in the US which opposes war, corruption and oligarchy is going to be infiltrated, monitored and manipulated, and there’s no reason to believe the faction which elected Trump on the basis of his anti-globalist and anti-interventionist positions wouldn’t get the same treatment. The same intelligence agencies which have successfully manipulated a large portion of America’s left wing into despising Assange are now manipulating the right wing into despising Snowden. The same social engineers who manipulated Obama’s base into ignoring his warmongering and oligarchic capitulations are now doing exactly the same for Trump’s base. Somebody’s benefiting from this, and it ain’t you. This administration is advancing longstanding neoconservative agendas with increasing aggression, perpetuating the Orwellian surveillance state of Bush and Obama, and actively pursuing the extradition and imprisonment of Julian Assange. Ignore the narratives and watch the behavior, and he looks very much like his predecessor. So cut out the narratives. Cut out the manipulators. 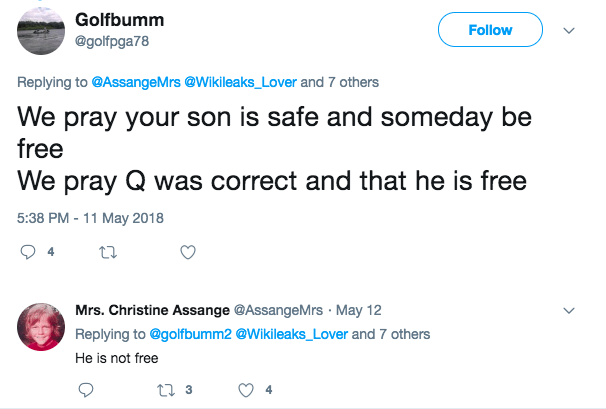 Cut out QAnon from the equation and look at what’s really happening here. that q repeatedly asks people to “pray” and makes references to “God” in a positive way, says to me that he has NO CLUE as to the larger picture – what is really happening now in creation and on this planet.